Silly question for the \"profesionals\" out there. How important is it to clip from the rock to you rather than from you to the rock. I always clip from the rock to me as I was advised to do but don't see the advantage especially when I am hanging by a finger tip and just want to get the damn rope clipped ASAP when my last clip/bolt is below my feet. If you are above the quickdraw, and have clipped it wrong (from you to the rock) then it is more likely that it will unclip when you fall off. In my opinion its very important. 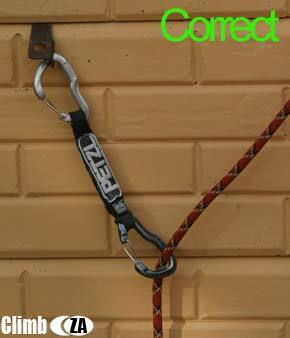 If you clip wrong and then carry on climbing and fall you risk the rope unclipping itself from the draw. On the other hand if you are not too concered about the redpoint and are pumped out with a substantial lead out below you, just clip the rope anyway you can. You can then rest on the bolt using a sling or another draw and correct the situation. 1. Rope coming from the rock out towards you. 2. The gate should face away from you, ie if you are climbing on the right of the bolts, then the gate should face left. 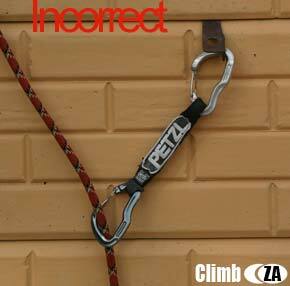 If you clip correctly, then there is less chance of the rope running over the gate and the rope unclipping when you fall. You know that old saying – there is never time to do a thing right but always time to do it again – well it does not apply to climbing! One of the things about climbing that I find so attractive is its real, you screw up and you could very well die, from the first bolt or from the 12th pitch. Clip right, I’m sure you wont live to regret it. whilst still on the ground clip the first draw from you to the rock. Then pull the rope up as if you were climbing past the draw. Now hold the rope and gradually pull it down on the gate side of the draw. You should notice a loop forming which could unclip the draw. Basically thats what i see could potentially happen and therefore try NEVER to clip the wrong way. Thanx Micky. Will give it a try that's the answer I was looking for. Feel a bit stupid for not thinking of it myself. One should add that the top biner on the draw should also face gate away from you (or where you will be when above the bolt) or it will do similar strange unclipping things with the the hanger. Make the biners on your draws face the same direction, saves getting confused that way too. Then there is the chance that the draw rides up the top biner loading across the gate...damn! I thought this sport was safe! In reality these things seldom happen, but seldom is not never! Do it right and you will be as safe as is possible with the gear presently available. Also consider the route above you. Its no good if you clip with the gate facing away from you, then go up and traverse so that you move across to the other side of the gate. 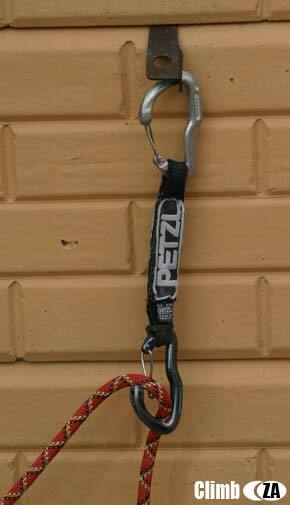 Its not as bad as it sounds, the rope will only unclip itself if the biner gets jammed and cannot swivel. I think this is one reason why quickdraws come with very thin slings these days, much easier for the biner to turn. brilliant quote: Real Danger : when statistics minus everybody else equals you …. Next time you're playing with your gear, try “accidentally” unclipping the draw while holding it against the wall. If it is clipped correctly to start with (rope running towards you), there is no way it will run over the gate and unclip. In other words, the direction the gate is pointing is only an issue if the draw is hanging away from the rock, as on steep routes. As Magnus mentions... \"try “accidentally” unclipping the draw while holding it against the wall\"